I hope you had a great start in the week. I don't work on mondays so mine is always starting great. Today I went to the city to pick up some pieces of MAC Magic Of The Night Collection which I missed during the online launch. I will post about these later on. In the evening I ended up having some hiccups due to terrible sample distribution from one of the brands. That on top of getting ready for tomorrow's lecture. I am ready for the weekend! LOL. Today I have a real collector's item to show you. Suqqu is going to release Kimono Duo, a set consisting of Glow Nuance Face Color Ex-02 in lovely golden hues and Creamy Glow Lipstick Moist Ex-19 in Crimson Red. 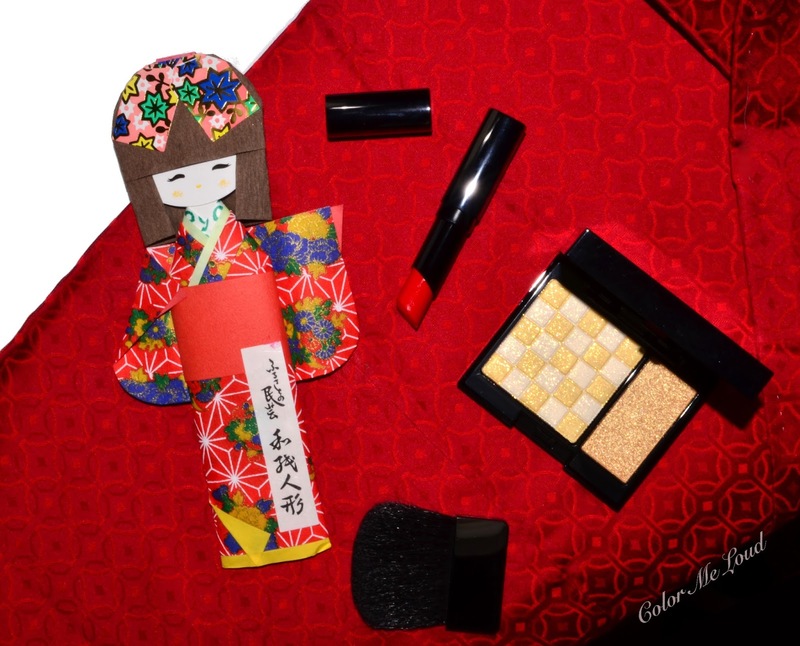 The inspiration behind the set is traditional Japanese craft techniques Kindami (金彩, gold leaf painting) and Benisome (紅染, dyeing with a special flower). 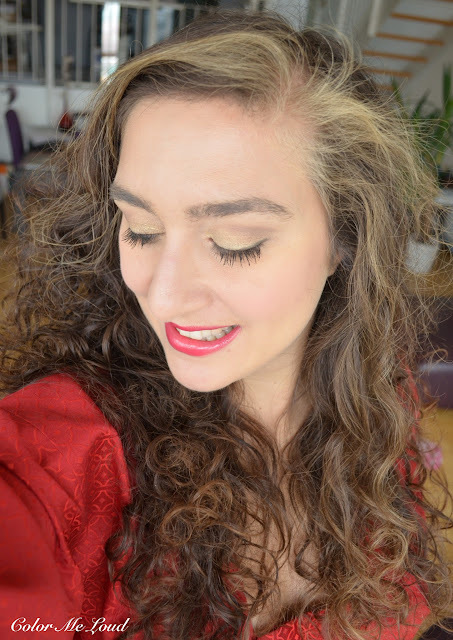 I decided to put my red Kimono which I picked during one of my visits to Japan in good use and posed with it for this FOTD, intrigued? Who can resist such a pretty pattern reflecting light in complex Suqqu shimmer. *happy sigh*. 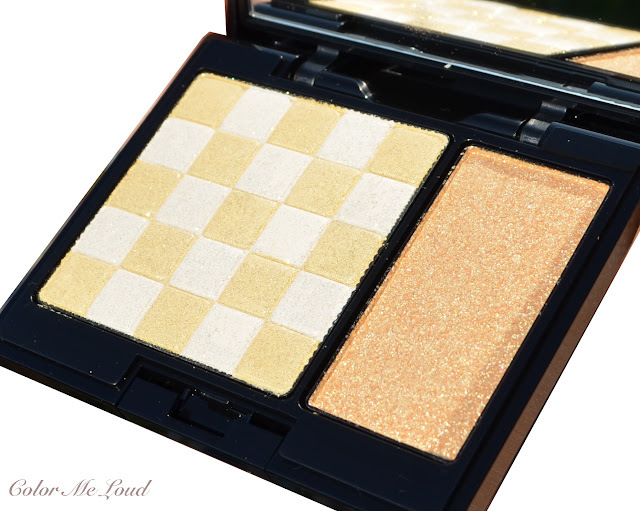 Glow Nuance Face Color Ex-02 has a checker board design is a mix of gold and champagne. On the right hand there is a more pigmented illuminator for eyes or face alike, reminding me of a gold leaf. It applies smoothly and is very wearable. 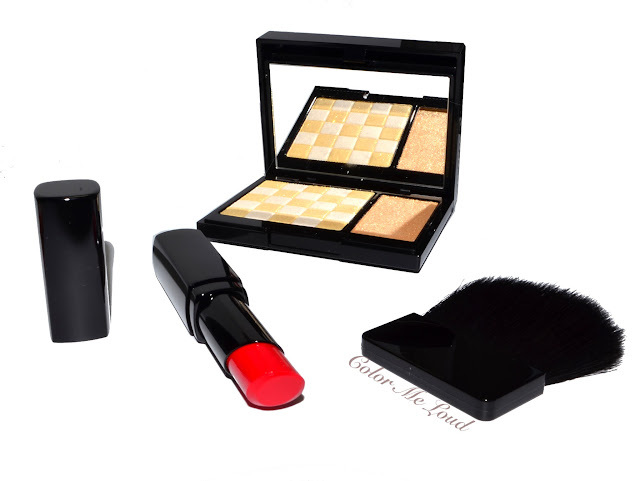 The packaging has two tiers, the compartment above holds a brush for touch ups on the go. 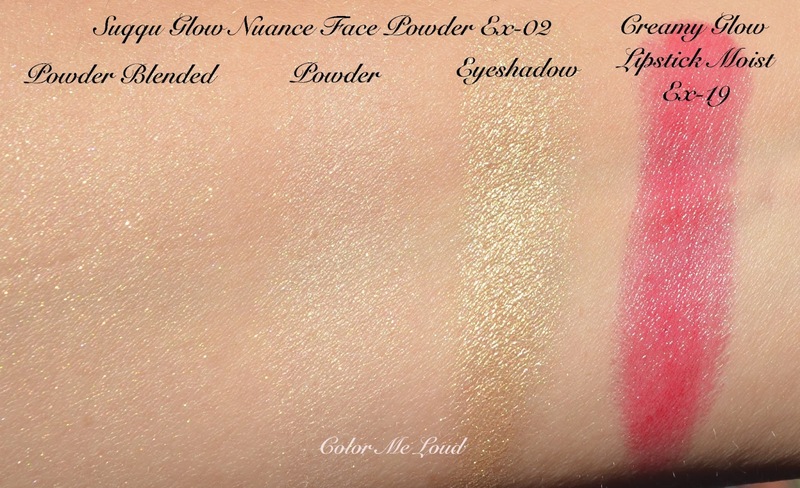 As I fell in love with the Face Powder, I didn't expect to love Creamy Glow Lipstick Moist Ex-19 even more. It is a pink red with the right amount of translucency to make it wearable during the day. Suqqu Lipsticks are very hydrating and they last long on me. They are a little sticky as opposed to slippery which I also prefer since I don't like the oily feeling on my lips. As you can see from the swatches below, the powder is very subtle so I like using it as an all over powder with a big fluffy brush. If I would like to use it as a highlighter, I go for a crease brush and apply it on the top of my cheeks. Since I have dry complexion and not so many pores, I can get along with lots of shimmer so this is a trick to pack some real shimmer in there by using a smaller denser brush. I used the golden leaf illuminator on the eyes but can also be applied on the face elsewhere. This is one of the looks I wore last week. I like using the gold leaf illuminator on black or brown eye shadow after smudging it or over a crew, eye shadow. Once I wore it over deep brown and ended up having a lovely khaki shade. It is lovely on its own too as you see below. I applied it all over the lid and defined the crease with MAC Omega Eyeshadow. I lined the eyes with Suqqu Gel Liner in Brown. I then applied the powder all over, no shame! It looks wonderful once the light hits the face and no way over the top. Here is me and my red Kimono. I love how it matches to the lipstick. Oh and so in love with the lipstick Suqqu Creamy Glow Lipstick Moist Ex-19. It is exactly the casual red I was searching for, so pretty! Too bad that it is a limited edition. Final thoughts: Big love for this collector's item. Aside from a lovely golden highlighter, the lipstick is to die for. This duo is a little hard to get hold of though. I hope it will be released online. Release Date is given as 6th of November at Selfridges, the price will be £70. In a few weeks Harrods is also supposed to get the collection. Check out here for more information and phone numbers of the counters to reserve yours. How do you like your red lippies? Translucent/opaque, warm/cold, matte/satin? The gold and red looks gorgeous on you ! That red lipstick is perfect. It is just the right shade. Can you think of any dupes? PS. Do you know where Sunny is? She just disappeared. The powder when blended looks really amazing! Very delicate and not "disco ball" sparkles. And that red is really perfect on you! So pretty! I love the look you did. 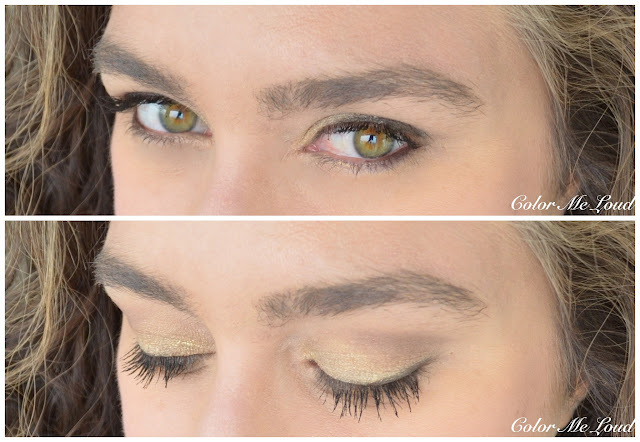 That gold shadow is really beautiful; I can see how it would be very versatile. Thanks so much Katherine. This is a combination I don't wear very often, maybe I should. Hi Alison, Sunny is doing great. I think she will write about it soon. She is hanging around at Instagram, are you there? thank you. LOL about the addiction. I know I am the same, check Selfridges everyday. Just a few days ago, they went online. I am sure you caught them, right? Thanks so much. Yes the shimmer is very complex, not even close to disco ball lol. I wear red and gold so rarely but I liked this combination too. LOL Lily, you look great in those all variety lippies, so get them all! On me only some work but this must be one of them. Hi Jess. It is versatile. I also applied it over a deeper base, looks khaki gorgeousness in that combination. I was thinking the same, no way it works on me lol but it did. 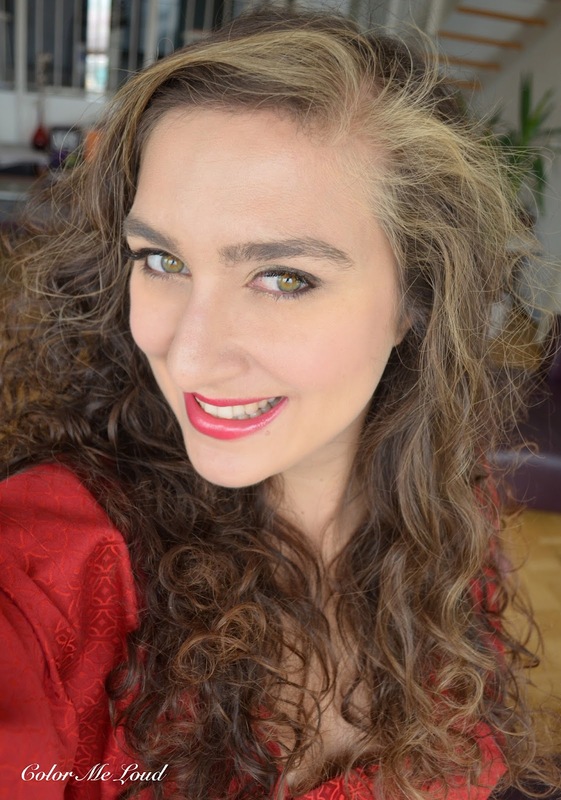 Red lipstick is rather cool leaning and a little transparent, so it makes it easier to work on different skin tones. Gold is subtle, great combination. I saw her posts on Instagram, but she was saying she was going to post on her blog and then it did not happen. I miss Sunny-- really love her blog, too.